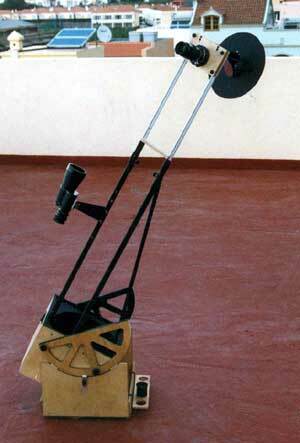 This was my first serious attempt to build a telescope myself in the year 2000 in order to have a telescope that can be easily carried along. In the meantime, I have replaced it with my 10" f/5 for reasons mentioned there. The 8" optics are now serving in a solid tube Dob on EQ platform that I use primarily for sun, moon, and the planets from my backyard. I started making this Dob with the main concern to have an 8" telescope that can be packed safely into a single solid box (except for the tubes) and that is compact enough to be transported in a suitcase or as carry-on baggage in airplanes. 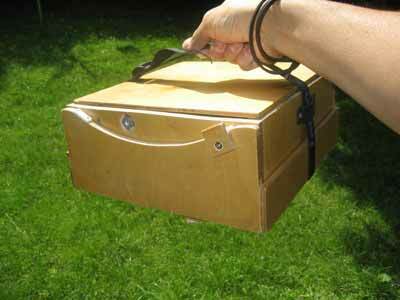 The box measures 28 cm x 28 cm x 12 cm, and the total weight is less than 6 kg. 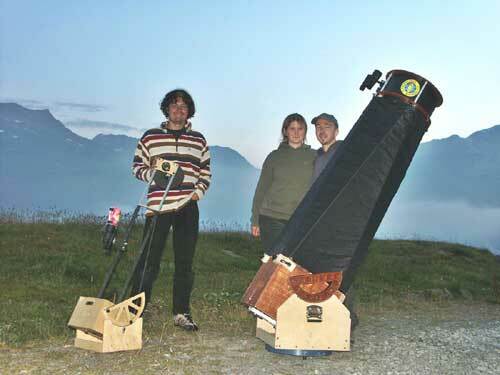 Making a travel Dob might be a good start into telescope making, as you could start with an existing mirror, as for instance that of your main telescope. 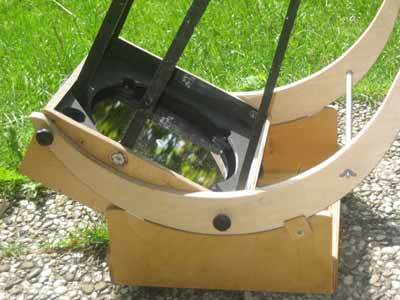 The mirror can then be switched between both telescopes depending on which one you want to use. This reduces the initial costs considerably, which might get you started more easily. 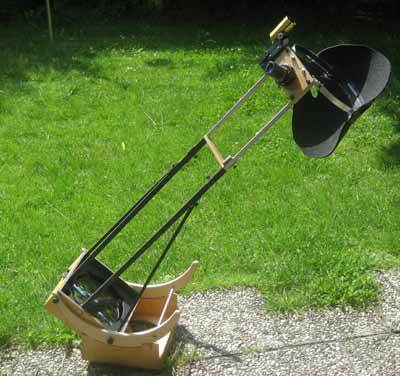 There are several nice example of classically built 8" travel Dobsonians on the internet. Due to the relatively long focal length and the resulting long lever arm of the eyepiece end, such a classical 6 or 8 truss tube design would be very difficult for an 8" f/6 mirror. I therefore decided to use only two main trusses, which had been done in a similar way e.g. by Mel Bartels or Stathis Kafalis. The secondary cage of these telescopes is reduced to the focuser mounted onto a small board, which holds the secondary by a V-shaped spider. This saves both weight and space. 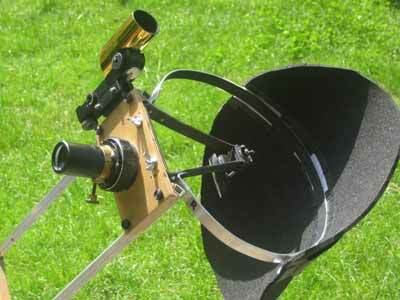 Many of the details were adapted from Stathis Kafalis' travel telescopes, that can be found on his excellent web pages. In order to allow a more comfortable view for low objects, I mounted the two tubes on two adjacent sides of the mirror box. 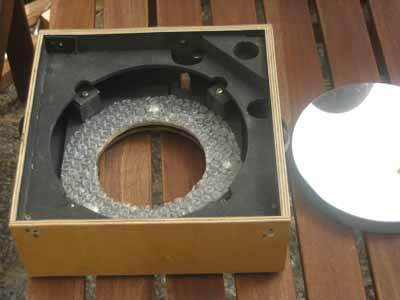 The focuser board forms therefore a 45° angle with the sides of the mirror box. 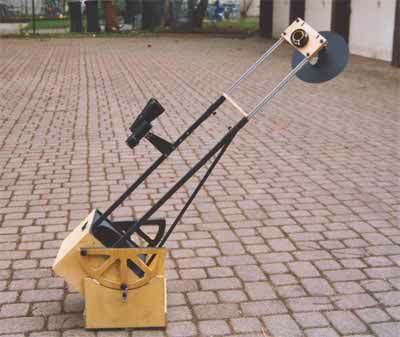 A similar design was used by Mel Bartels in his 6" Travel-telescope. The two main trusses are stabilized by two additional diagonal struts. This makes the telescope surprisingly stable. Turning the telescope from vertical to horizontal affects the collimation only slightly, such that telescope remains diffraction limited on axis in every position. Assembly takes about 10 minutes. If necessary, imbalances due to different eyepieces can be compensated by a tunable weight that can be moved along one of the upper tubes. 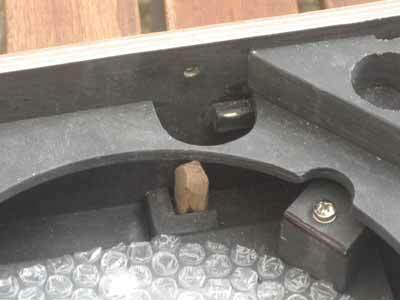 The focuser unit (look here for more details) consists of the mechanical part of an old defective 50 mm lens for an SLR camera, fitted into a small plywood board. This yields a focuser unit with only little height, but limits the focuser travel to about 12 mm, which is in general enough. 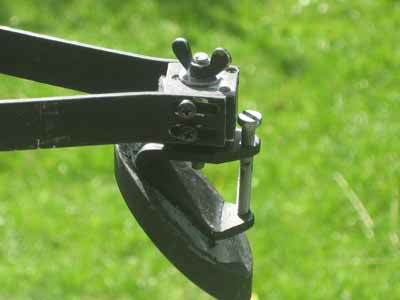 If needed, the focusing range can be extended easily and rapidly by adjusting the length of the split tubes. 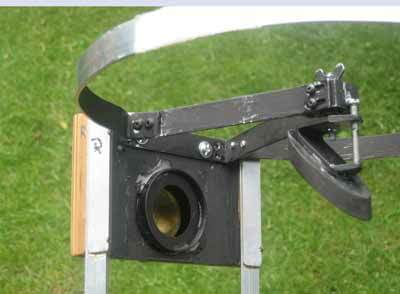 Stray light is prevented from entering the eyepiece by a built-in baffle behind the focuser and an additional shield attached to a ring around the secondary holder. The 40 mm secondary was attached to a very simple but fully adjustable (turn and tilt) secondary holder by silicone glue. 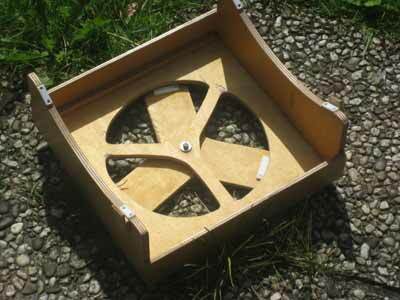 The "spider" is made of an 20 mm x 1 mm aluminum sheet, which is sufficiently stable. The entire focuser/secondary assembly is extremely light. Low weight is essential at the long end of the telescope, where every gram adds up. 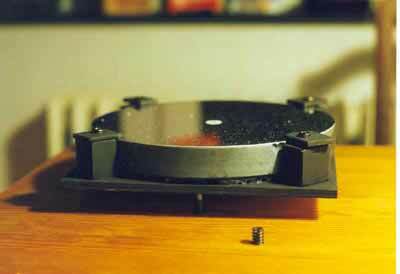 As a finder I use a light-weight red dot finder at the side of the focuser board. The mirror box measures 25 cm x 25 cm (inside) and is made of 6.5 mm birch plywood, either oiled and waxed or painted black. Only the two sides that hold the tubes are made of 9 mm plywood. The tubes are inserted into conical fittings at the bottom of the box and are fixed with two bolts on the side panels. 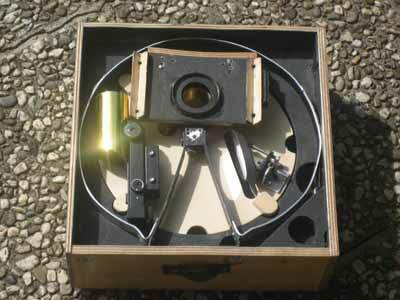 The box is strengthened by the bottom board and by the aperture mask above the mirror. There is an additional reinforcement in the corner where the two main trusses are attached. 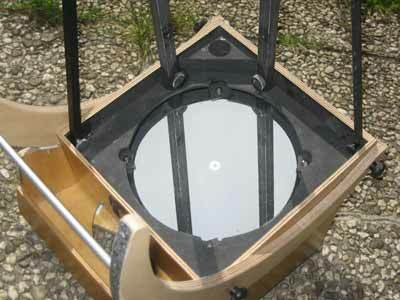 The mirror can be covered by plywood board sitting directly on the mirror cell. 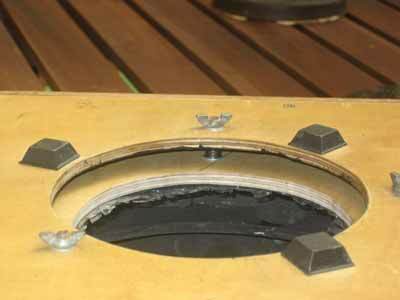 The mirror cell is very basic: the mirror sits on air bubble packaging material on a plywood board and is held by side stoppers and small "locks" that fix the position of the mirror. This is sufficient for the 25 mm thick mirror. Collimation is achieved by three 5 mm bolts and small springs. The mirror is placed in the mirror box slightly off-center to provide more space on the side where the tubes and the focuser assembly are attached. 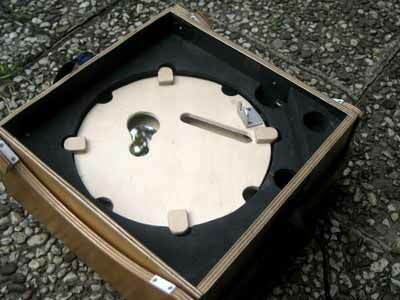 The rocker box is made as well of 6.5 and 9 mm birch plywood. The 12 mm altitude bearings have 42 cm diameter and are coated with a structured laminate, running on Teflon. The bottom of the rocker box is also laminated. 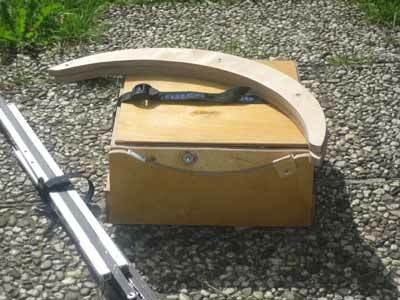 To build the rocker box, the position of the center of mass of the telescope had to be calculated in advance from the weight of the single parts and their estimated position at the telescope. This worked pretty well and in good agreement with the position determined later on "experimentally" after assembly of the whole telescope. As expected, the movements of the telescopes in the bearings are smooth. This is the first version of the travel Dob that was built in 2001. 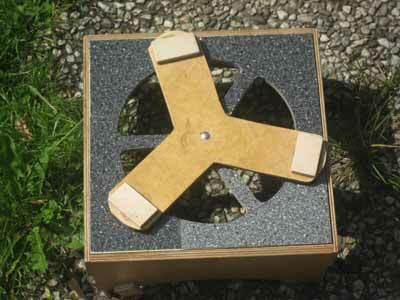 In this first version, the secondary remained attached to the focuser board for transport, requiring a higher mirror box. Further, the stray light baffle had been attached directly at the secondary holder and is replaced now by a baffle outside the path of light.